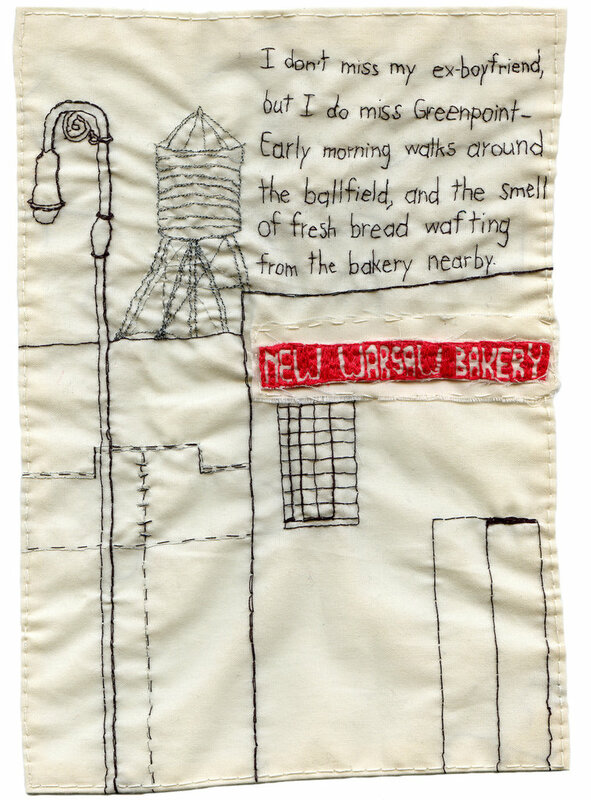 Iviva Olenick is a Brooklyn-born and -based artist focusing on narrative embroidery (story telling through embroidered text and drawings). Iviva’s work is shown at Muriel Guepin Gallery in Cobble Hill, Brooklyn, and can also be seen adorning the light boxes at 61 Local, a local bar at 61 Bergen Street right off Smith Street. 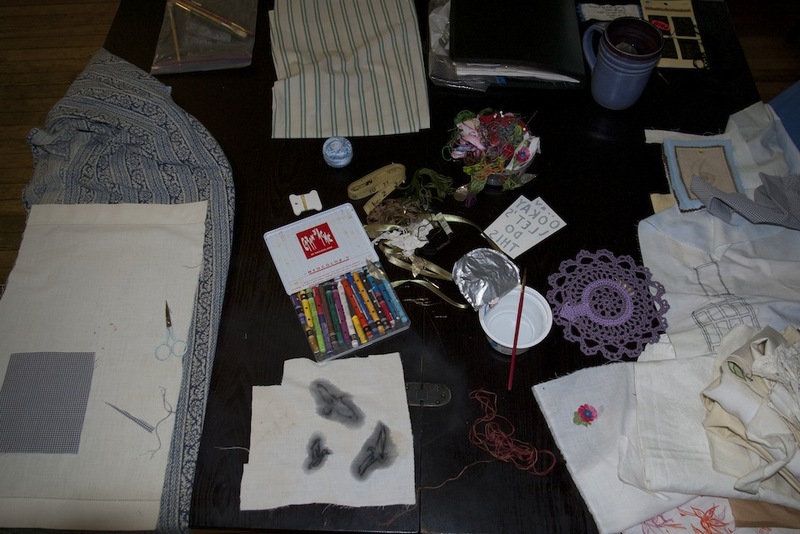 Iviva learned to sew in kindergarten, and adopted embroidery as her primary artistic medium in 2005. She has a BA in French Literature and Psychology from Binghamton University, and an AAS in Textile/Surface Design from the Fashion Institute of Technology. 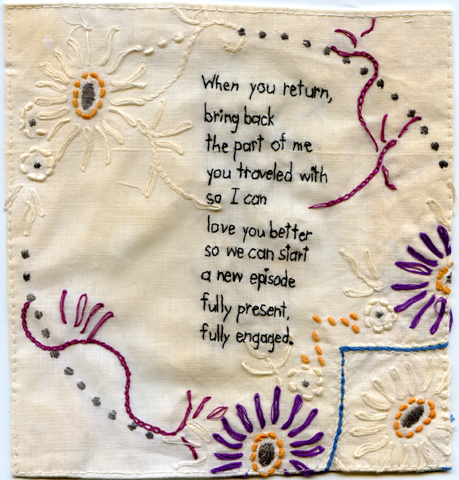 IVIVA OLENICK: I like to sit in my Grandmother’s old armchair with a felt blanket wrapped around me watching tv or movies on Hulu.com while I embroider. The felt blanket was made by artist Liz Burow. 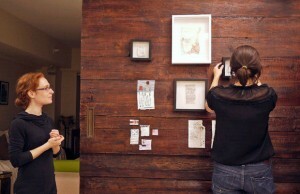 I bought it during the open studios at the Invisible Dog on Bergen Street last year (2011). 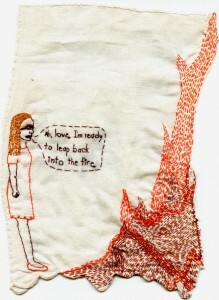 Embroidery captures the troubled thoughts before I gain clarity, as well as the resolution, once there IS resolution. IO: Other than the above mentioned armchair and felt blanket, my embroidery scissors. When I was 30, I went back to school to study textile design. I took a 9-month crash course at FIT (Fashion Institute of Technology). During school, I was too busy to embroider, which was frustrating, to say the least. I spent most of my time painting with gouache, something I had never planned on doing. I ended up having nightmares in which I was being chased by my embroidery scissors. The scissors are small with sharp and carefully angled tips. The tapered tips fit perfectly underneath stitches in case I ever need to pull something out. Finally, the scissors have orange handles. FYD: What is the criteria for a good embroiderer? I’m certain patience plays a role. IO: Patience, vision (literal and figurative), agile hands, sensitivity. I’m interested in human truths (desire, fulfillment, loneliness, hope), and the quirky ways in which we interact with each other in service of these truths. FYD: Talk about your process. 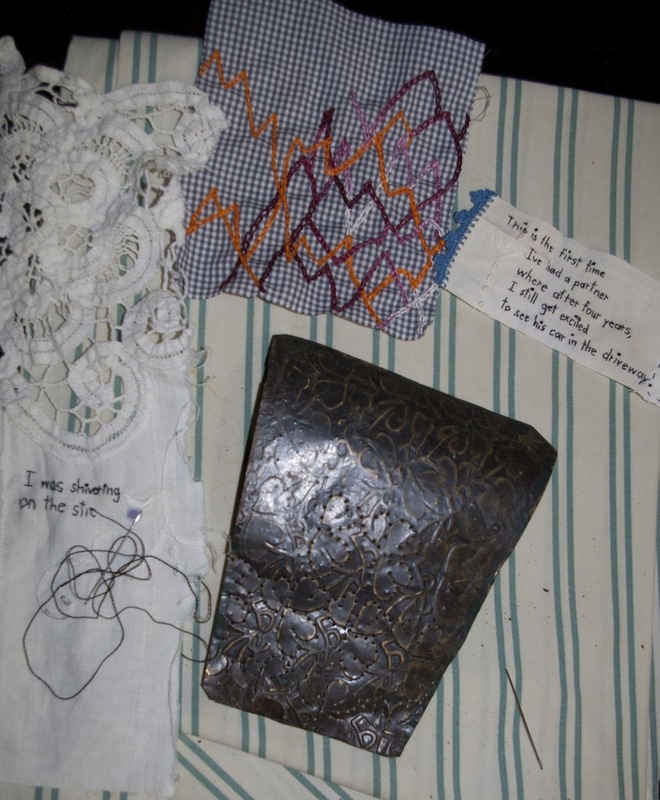 Do you journal, write and transfer onto material or sit down and stitch out a narrative? 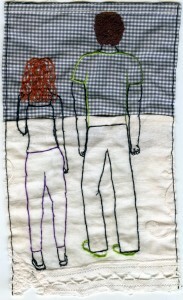 IO: When I first started embroidering pictorially, I would sketch my images out on fabric before embroidering. Now, I most often work directly with needle and thread. The only time I transfer an image is when I am recreating a map, as in my Brooklyn maps. In terms of my text, it is also stitched directly onto fabric. I “hear” phrases all the time, which I type into my iPhone and later translate into stitch. When I say that I hear phrases, I mean that I regularly find snippets of language to describe an experience I’m sifting through. FYD: We all have maps of life, especially relationships. 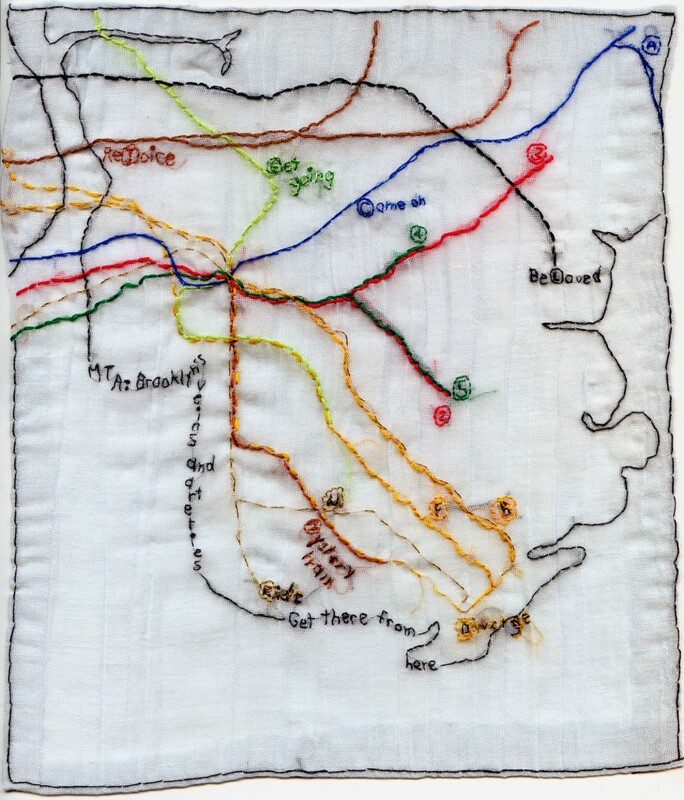 Does embroidery, like your map of Brooklyn, help create closure or excise ghosts? IO: The only thing that excises old ghosts is running. When you’re on mile 10 of a hard run in 29° weather, you’re physically and emotionally vulnerable and exhausted. There’s an amazing psychological window that opens up and allows things that formerly made no sense to start becoming clear. 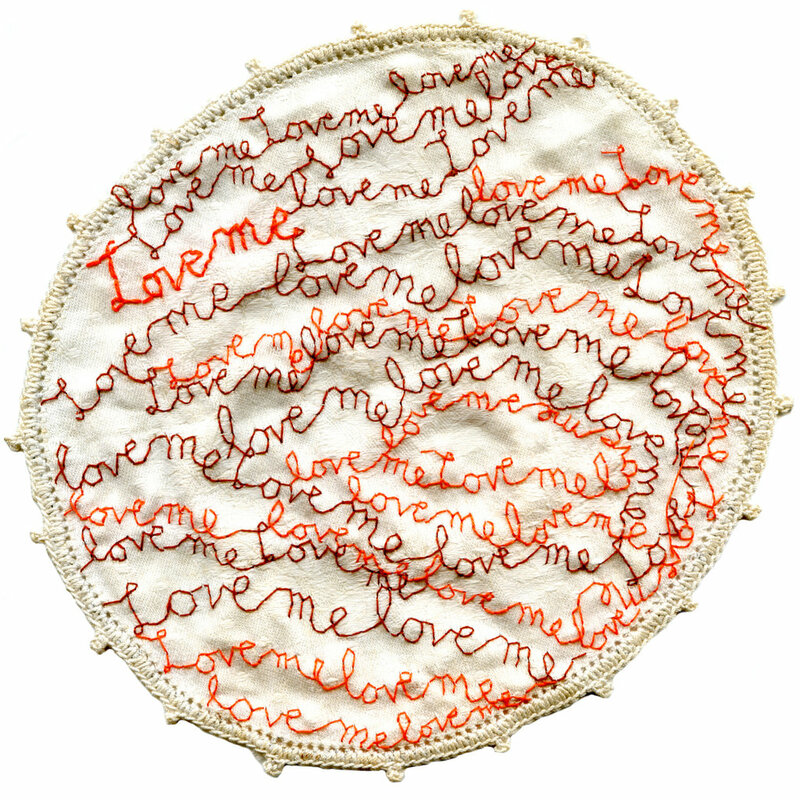 Embroidery captures the troubled thoughts before I gain clarity, as well as the resolution, once there IS resolution. FYD: You must be an active listener. Do you transcribe what you hear on the streets and inside the world of New York? IO: I think what I observe visually, including body language, may resonate even more than what I hear. I do catch snippets of conversation, but when I say I “hear” things, I mean that I write snippets of text in my head, which I later transcribe into embroidery. I sometimes type these thoughts in the notes section of my iPhone so that I don’t forget them. FYD: Can you share a specific observation which influenced one of your pieces? IO: I was at the gym and saw a man and woman next to one another on the steppers (the very steep machines that mimic walking up steps). She was faced forward, and his entire body was turned towards her. There was something so tender in his movements. The man and woman each slowly and exaggeratedly climbed those steps. It looked arduous, yet his focus was on her. Seeing them really affected me. I stitched “Turn Towards Me” in response (see right). My resulting image is not as dramatic as what I remember from the gym scene. The quiet conversation between the man and woman fascinated and moved me. FYD: Do you consider yourself a sentimentalist or a romantic? IO: A romantic yes; a sentimentalist, no. IO: I tend to dislike the term “sentimental.” In the context of describing artwork, I consider it negative or diminishing. I am interested in human truths (desire, fulfillment, loneliness, hope), and the quirky ways in which we interact with each other in service of these truths. I aim for subtlety rather than sentimentality. FYD: What is it about New York and love? They meld so well together but the end –of a relationship–is always a sad or maybe it’s the thought of being alone in the big city? IO: I am a native New Yorker and have always been fascinated by how and why some relationships fail while others succeed. (I even conducted research on this as a psych major in college.) Since the City is my home, I don’t feel alone here; my family is here, as are most of my memories. I do feel lonely in the sense of not having found the romantic partner I’m looking for. I think this is the plight of being human, though. It’s something we all experience at one time or another. FYD: Is it hard to jump back into the fire after a failed relationship? At some point, we all go through it. IO: Some breakups or dissolutions of love are more painful and shocking than others. Yes, it’s hard, but the reason we’re here is to love. I always a desire to love as my motivating factor in relationships, not only romantic ones, but all important relationships. FYD: What New York filmmakers or artists inspire you? 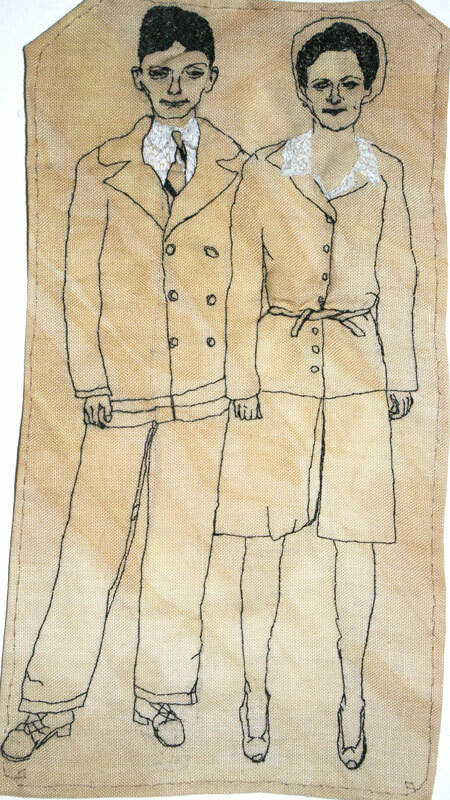 IO: I love the illustrative and written work of Maira Kalman I appreciate how she engineers a page to combine text and drawings. FYD: New York art critic Jerry Saltz sent you feedback of your work on Facebook. Did you heed any of his advice? IO: Well, I DO drink a lot of water and work all day. When I have deadlines, I do stay up all night (or more likely wake up in a panic at 3am and start stitching). I love Jerry Saltz’s tremendous sense of humor and playfulness. He is a true voice of New York City, and a needed addition to contemporary art criticism. 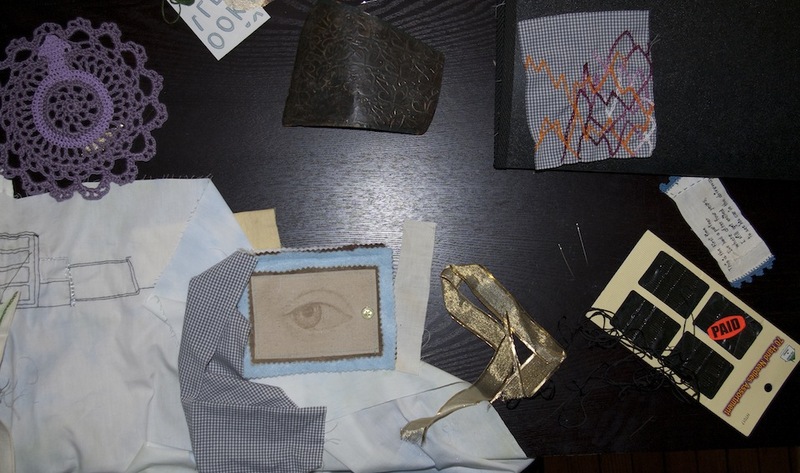 Iviva Olenick’s work is currently on view at BAC (the Brooklyn Arts Council) from March 1 thru July 22.